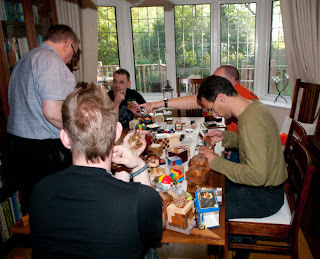 Earlier this week I celebrated my birthday and it turned into a rather puzzling affair. There are a few websites that I like to keep an eye on fairly regularly just in case something interesting comes up – Cubic Dissections is one of them. A couple of weeks back I happened to notice some really weird things happening to some of the listings – they seemed to be multiplying and moving around on the web page, then they started changing, but they all seemed to be referring to items that were sold out. The next day the movements seemed to begin to take shape and settle down and shortly after that I received Eric’s traditional email warning that some new stuff had been added to the web site for anyone that was interested. Now last time that happened a couple of months back, the warning email arrived just after I’d turned off the netbook for the night and by the time I logged on the next morning, a couple of the really interesting items had already all been sold out – dagnabbit! I did get a few really nice items anyway, and managed to pick up a copy of Three Sticks Trapped when Oli decided to get rid of a couple of the items he’d managed to buy, so it wasn’t a total loss by any means – just in case you’re beginning to feel the need to be sympathetic! This time around, things were different – I piled in straight away and managed to get everything that I wanted – and Eric’s usual efficiency and the fact that the parcel came straight to my front door (instead of spending a week or so in customs first!) meant that I had my new toys pretty soon afterwards – and in good time for the next MPP where a few of them got passed around among some of the folks who hadn’t managed to pile in quite as quickly as I had. Stand Py Me was designed by Gregory Benedetti and published earlier this year. It was added to Ishino’s website in May this year and 4 short months later(!) 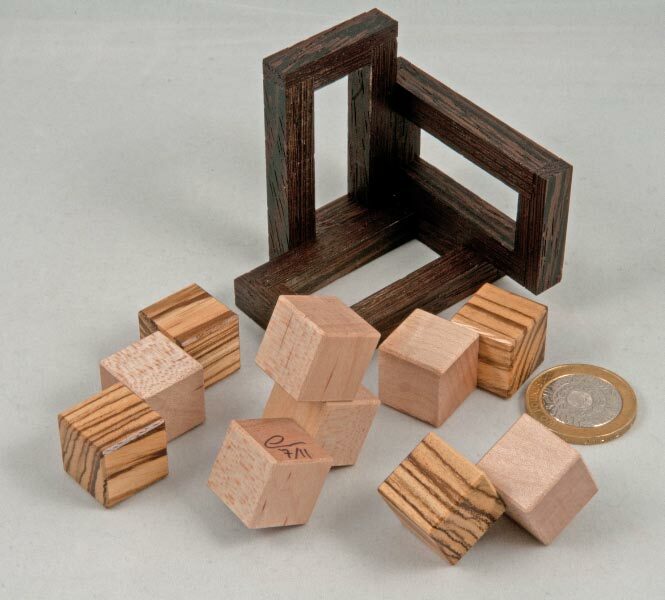 there was a discussion about it on Renegades, with Gregory explaining the name was a play on words around a “Py-ramid on a Stand” – with the basic internal structure resembling those pesky offset cube puzzles like Coffin’s rather famous three-piece block puzzle. Stand Py Me starts with a four-piece offset cube structure in the shape of a tetrahedron – but adds a twist by insisting that it should be built in a frame that captures three sides of the pyramid. Now Gregory is rather well-known for his puzzles having a bit of a twist to them – in fact his Youtube channel name is “Rotations Required” ... so when I attacked this puzzle, I had that foremost in my mind and subsequently spent several fruitless sessions trying to engineer a means of partially assembling the pyramid in situ and then twisting the last pieces into place. After trying that approach for quite a while, I wondered out loud if there might be a simpler, purer, better way of doing things –the dogs gave me a very strange look at this point. From there it honestly didn’t take long to find the right, rather elegant solution that allows everything to slide perfectly into place out of position and then slide into the final positions required to make the pyramid. Eric has made these puzzles beautifully - his attention to the details is staggering: just take a look at the joints on those frames! And his kindly using a contrasting wood for the extremities definitely helps numpties like me solve the thing. 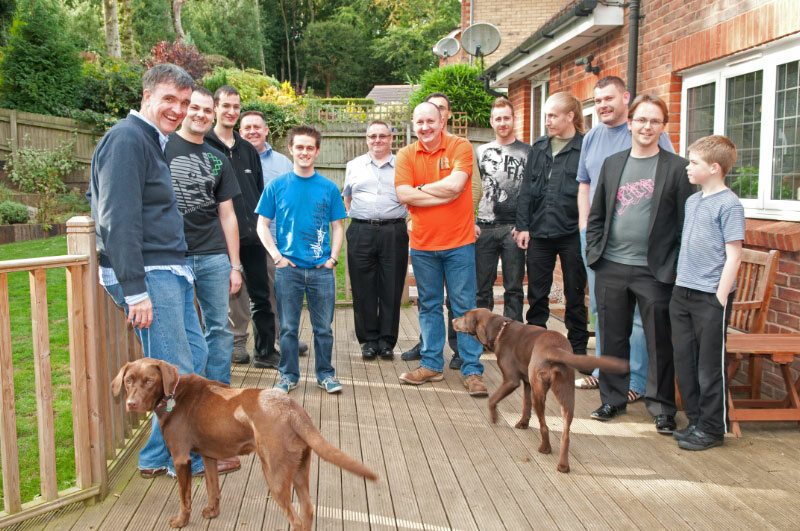 Neil’s already shared his thoughts on this puzzle in his blog and you can read them over here. Two Pi is another Gregory Benedetti design from 2009. 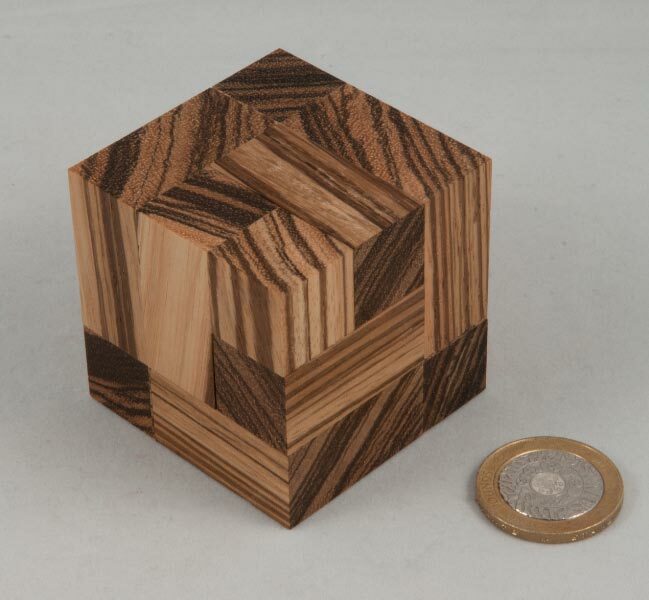 This one is a three-piece cube that Eric’s made out of Zebrawood. Eric made up a beautiful version of Martin Watson’s Digigrams. Martin tells the story on his website about coming up with the idea for the puzzle one night when he couldn’t sleep and found himself watching his digital alarm clock tick over. 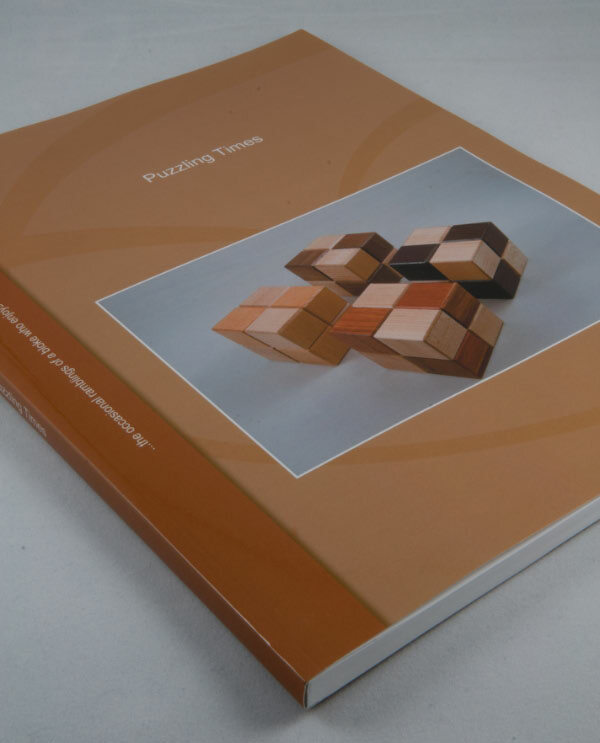 Since then it’s been made in several formats and sizes (e..g take a Look at Steve Strickland’s version over here) and served as an IPP exchange puzzle in Tokyo in 2001. The premise is simple: arrange the digits 0-9 inside the 4*5 tray. 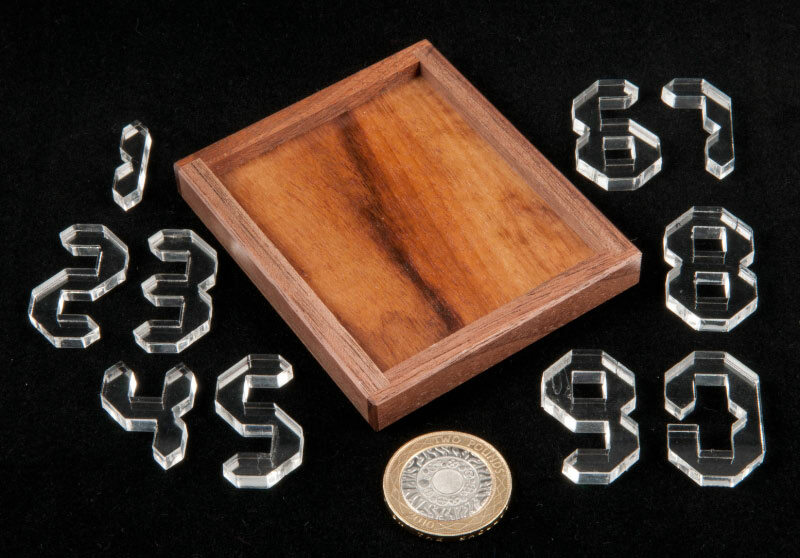 Eric’s version uses clear laser-cut acrylic digits and they look terrific against the grandillo base of the tray. You can read Jerry’s thoughts on this puzzle over here. Galaxy by Osanori Yamamoto was one of the puzzles that I missed out on in the last round at Cubic Dissection so I was delighted to find that a couple more had been put up for sale in this round. 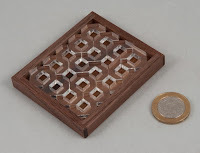 Four identical burrs need to be inserted into a frame – and the clue to the complexity of this fiendish little puzzle is summed up in the fact that it’s a level 18.10 burr – so that’s 18 moves to release the first piece, and then another 10 moves before all three of the remaining bits come flying out, together. 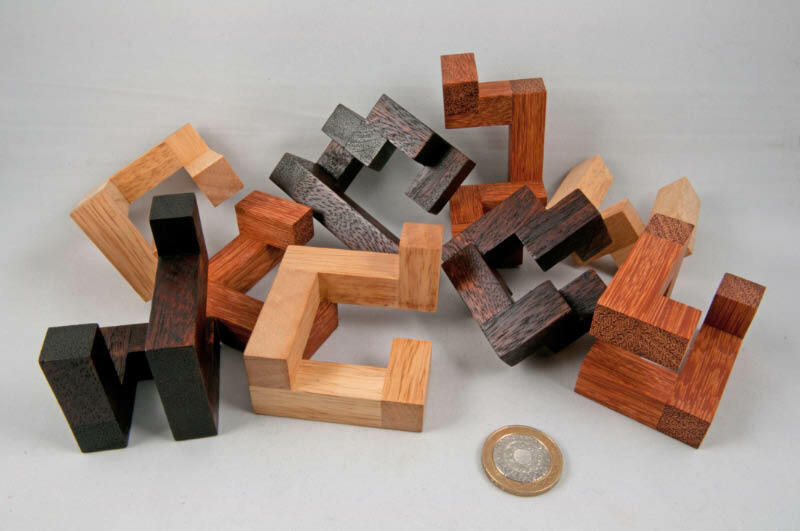 It goes without saying that Eric’s work is great on this puzzle as well – one little thing to be aware of is that because the puzzle has so much air in the middle, some of the pieces will want to lean over and that will impede progress – best to keep your bits upright. Havanna’s 2 by Alfons Eyckmans is a lovely four-burrs-in-a-box puzzle. 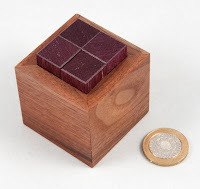 Eric has made the burrs in purpleheart wood and it looks brilliant in the walnut box. 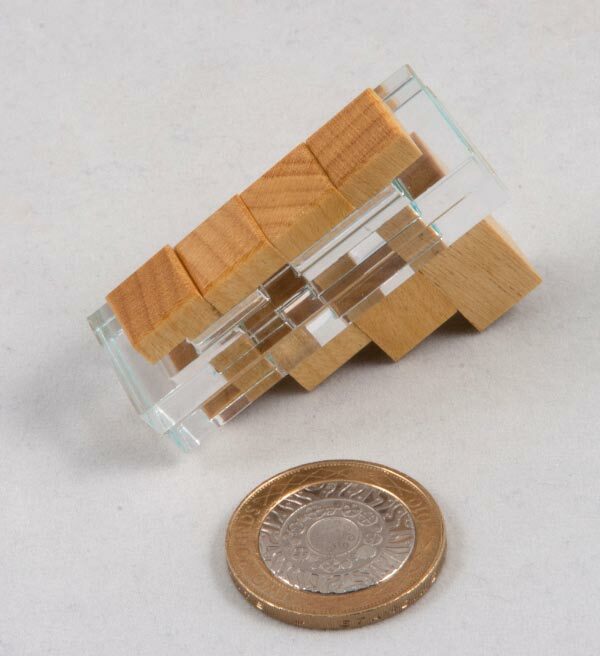 This one’s pretty tricky and removing the first piece takes an awful lot of manoeuvring of all the bits in the box. The first time you try and take the puzzle apart, your immediate challenge is trying to work out where the stoppers inside the box are and more or less what shape the pieces are – and having removed them, realising that the pieces are somewhat more complex than I thought they were. Several far more eloquent writers have already blogged about the Zauberflöte. 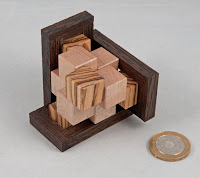 Neil raised some interesting questions about ‘solutions’ on Renegades using this puzzle as an example – specifically, if rotations are clearly possible on a puzzle design, should they be allowed in a solution – and it was quite interesting to hear from Gregory “Rotations Required” Benedetti who designed this puzzle, that as far as he was concerned, even if a puzzle wasn’t designed to use rotations (and this one hadn’t) if they were clearly possible and they resulted in a shorter solution, then absolutely they should be used and explored! You can read Neil’s take on the puzzle over here. Puzzle-solver extraordinaire Brian Pletcher has written about it over here and the professional number (think about it! ), Kevin, has written about it over here. 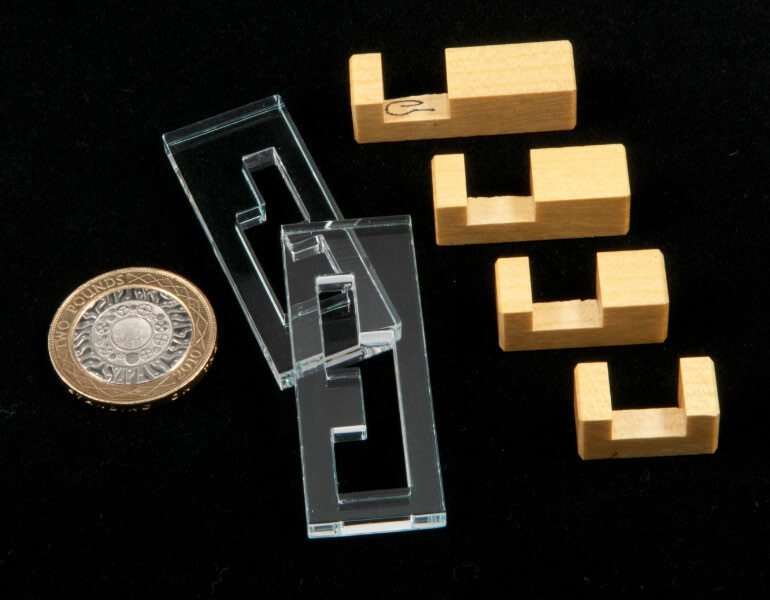 All I’d add to their expert opinions is another vote for this format of clear acrylic boards combined with lovely hardwood bits – it looks great next to Eric’s Padaung Rings! 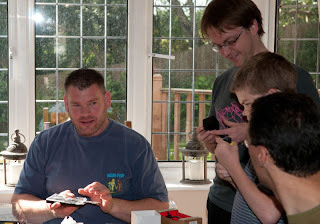 The fourth Midlands Puzzle Party took place yesterday and I managed to con the gang into using our place as a venue yet again so that I wouldn’t have to travel anywhere or pack up any of my puzzles. Louis, our regular visitor from Eindhoven (and now four time winner of the furthest travelled prize! 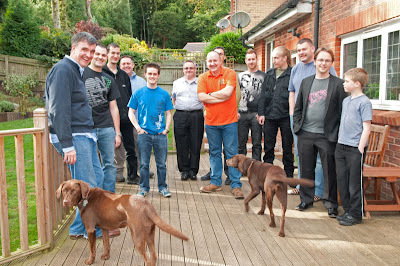 ), arrived on the Friday evening and the puzzling began pretty much as soon as we got back to my place. 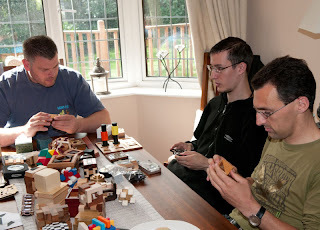 Next morning the rest of the bunch started arriving thick and fast from about 10 o’clock onwards, and by about 11 virtually everyone was gathered around the dining room table playing with someone else’s puzzle over a cup of tea or coffee. A damn fine start to a good day’s puzzling! 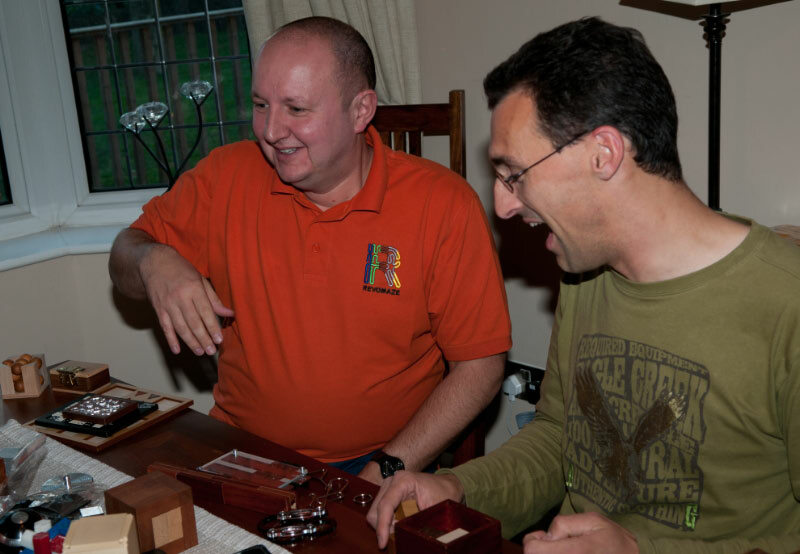 It was great to see a few new faces – Russ and Adin off the Revomaze forum and Jez who’d met Ali and Oli at the 100th Camden Lock Puzzle Party earlier this month. Jez brought his son Charlie along for the day (which included a 5-hour round trip drive - RESPECT!) – hopefully we didn’t scare any of them off! Speaking of scaring people off, it was great to have the return visit of Paul after his first and only appearance at our very first MPP. Most people brought a box-load of puzzles along for the day – most people that is, except for Russ, who brought along a set of lock picks and a practice lock or two – in his defence they are all purely for recreational use, and knowing someone with those sort of skills is bound to come in handy one day ... Several folks had a go at picking the locks on offer and learning a new skill – although it was a bit worrying when Chris Pitt, the designer of those Revomaze puzzles, was found trying to pick a Revomaze – apparently it was only research and he can open them, properly, anytime he wants (and he didn’t inhale)! 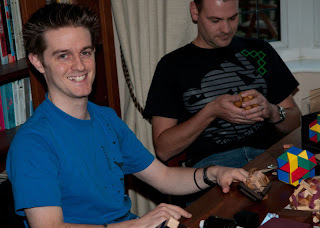 When Oli had arrived he produced the Alles Roger that’s been taunting him for a while and placed it in the middle of the table, inviting everyone to have a (figurative) bash at it along with the warning that if anyone solved it, he would be forced to kill them – game on! Several folks had a bash at it over the course of the day and there were several discussions about Brian’s recent blog post on the same puzzle announcing that he’d finally found a really satisfying and elegant solution that didn’t rely on random bashing and shaking. Many tried and I’d like to say that everyone failed, if only to avoid getting blood on the carpets when Oli lost it, however over the course of the day, the puzzle appeared to miraculously solve itself ... I think I was the first one to notice it when I picked it up around lunch time – it was facing away from me as I picked it up and as I turned it around, my brain registered that the ball was in the lower channel and then I watched helplessly as it rolled right back to the start as my brain was too slow in telling my hand to stop picking it up that way ... curious ... I told a couple of unbelievers what had happened and asked who’d solved it to be greeted by a Great Wall of silence – presumably Oli’s promise of blood was too much of a deterrent. A couple more times that afternoon others noticed the same thing though, and in the end it turned up solved three times, mysteriously, among a crowd of people who all professed not to be able to solve it. (Not quite true – Ali had solved it, but promised he hadn’t been party to the miraculous auto-solving Alles Roger phenomenon of MPP4.) I wonder if we’ll ever know what really happened that day ... No puzzlers were harmed in the making of this story, although we believe the threats were real. During the course of the day, Oli separated himself from the mad(dening?) 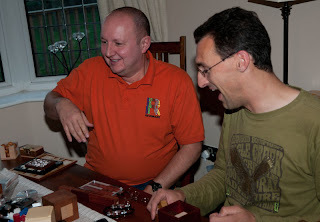 crowd and had a go on Eric Fuller’s Triple Locked Box - and he actually solved the thing! There was virtually no nudging or hinting, he found the doo-hickey on his own (serious achievement!!) 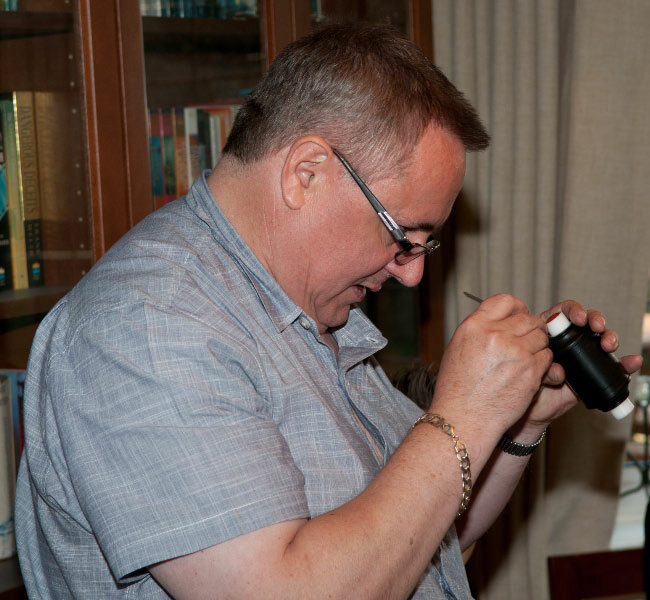 and then opened it – tremendous effort Oli! 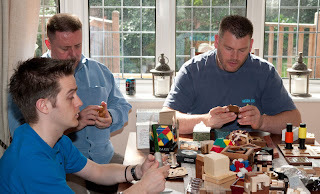 The puzzling slowed down a little bit over pizzas at lunchtime, although Chris Pitt was chatting animatedly about his puzzles while people passed around his tiny handmade version of a blue Revomaze – that little puzzle is a fully functional version of its significantly bigger brother, machined by hand in brass – phenomenal. If he’d had a spring assembly available I know several people who’d have taken that puppy for a test-drive ... and several people did have a go on his first prototype Revomaze in all its shiny, raw, handmade goodness. Later on in the day, Jez hauled out his iPad and showed us a great little puzzle app he’d found called Cross Fingers – a few of us had a go and quite liked the puzzles and found the gameplay to be pretty slick – I downloaded a copy this morning ... just to fill the time while we all wait for the next episodes of Cut the Rope and Angry Birds, you understand. Several people managed to go home with some shiny new puzzles – half our order of Makishi boxes had arrived a couple of weeks ago so I was able to dish out a few of those as well as pass on some rather more collectible pieces to Chris and Ali - I got a HUGE kick out of being able to source a couple of Stickman boxes for them – not sure I’ll ever be able to do that for someone again, but that was pretty cool! Big thank you to Chris who delivered my rather handsome Daedalus courtesy of Gregory “rotations are required” Benedetti ... after spending the best part of an hour and a half on it this afternoon, I know exactly how he earned that middle name! Thanks to everyone who came along and made the day so much fun – thanks Ali for bringing some grub and thanks guys for the wine and choccies. 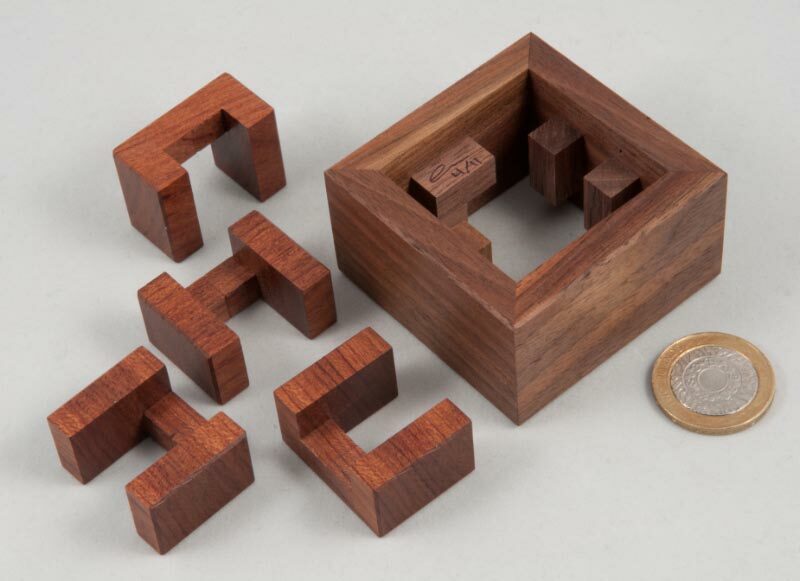 I noticed this puzzle in the Cubic Dissections Gallery a while ago, so when Robrecht’s 4-Steps Visible Lock won this year’s Jury Grand Prize at the Nob Yoshigahara Puzzle Design Competition in Berlin, I decided that was as good an excuse as any to try and get hold of a copy. Wil Strijbos sent an email around offering some 4-Steps for sale, so I followed up with an email asking if he happened to have any of the earlier ones, particularly the Cerradura Doble, available for sale. Turns out he managed to find one for me and the package was practically on its way before I’d even had a chance to pay for the puzzles – Wil’s fiercely efficient at these sort of things! I hadn’t paid a lot of attention to the dimensions of the puzzle when I’d seen it in the Cubic Gallery, but when I unwrapped it from its cocoon of zip-lock baggie and well-taped bubble wrap (Wil wraps well too!) it struck me as bigger than I’d expected – making for a pleasant size and weight – and something handy to throw at an intruder, if the need ever presents itself. A clear piece of acrylic keeps everything together and visible: there are a pair of steel keys marked “UP” and “DOWN” that move in and out of two milled channels in the base and a set of 5 sliders with unique combinations of notches that interfere with the bumps on the steel keys. 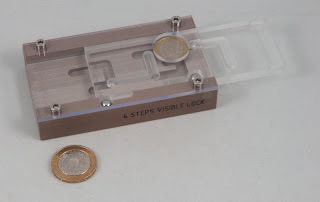 Your aim is to remove the steel keys by playing with the 5 sliders. My approach to these sort of puzzles is rather agricultural, not particularly efficient, but generally results in a fairly decent outcome – it also results in a fair amount of play-time per puzzle, which after all, is what it’s all about anyway, in my books. So I pick one of the keys to focus on and fiddle around with the sliders to get that key as far out as I can … invariably getting to the point where progress is blocked by things that can only be resolved by moving the other key, so switch attention to that one, getting it as far out as possible, until it too is blocked unless the first key moves, repeat until solved. Every now and then you’ll find that you’ll need to backtrack a bit in order to get things freed up a bit, but that’s a small price to pay for a fairly simple approach. From memory I think I had to backtrack a few times, but not by a huge amount. The sliders are nicely made and movements on all pieces are smooth and positive – if it looks like it should move, it will, making it a very satisfying puzzle to play around with. The supplied solution lists a total of 80 steps to completely remove both keys, and I’m guessing that follows the most efficient route possible for the standard starting position. I didn’t feel that my agricultural solution was significantly longer than that, so perhaps Robrecht has been kind to people who adopt my sort of approach of muddling around and only going backwards when they absolutely have to – I can imagine that a less well-intentioned designer could plant some horrible dead ends where the ideal solution was actually rather short, but that the solution would lengthen significantly if you used a strategy of pursuing each key individually until it becomes irretrievably blocked … don't you dare get any ideas! 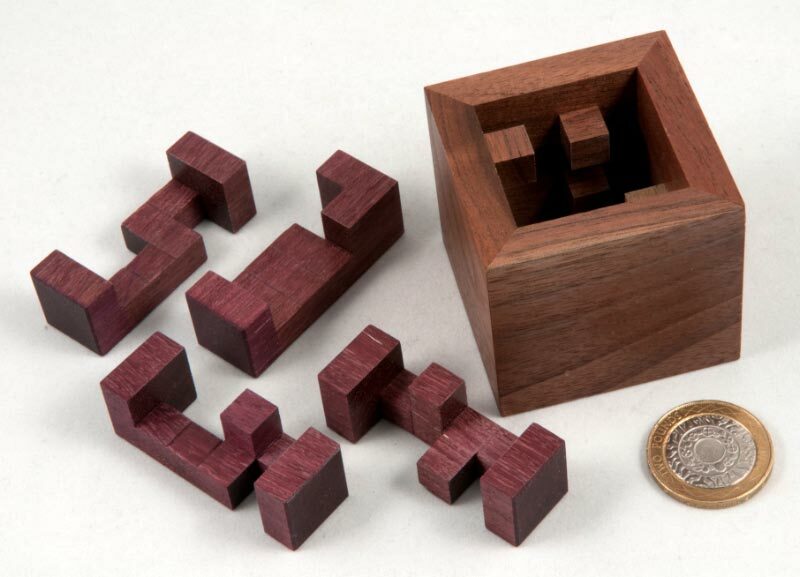 Overall, a really nice, well made puzzle with a satisfying solution – not too complex, definitely accessible for most … nice one! 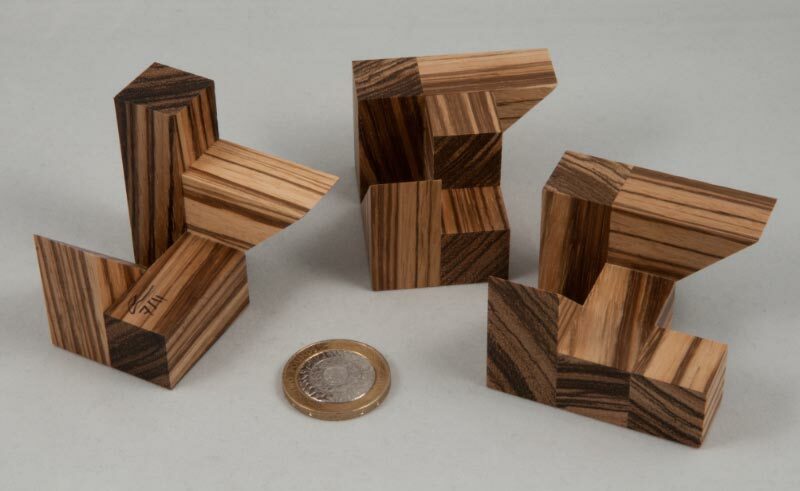 Robrecht Louage’s latest design was awarded the Jury Grand Prize at the 2011 Nob Yoshigahara Puzzle Design Competition in Berlin. Get one (if you can)! 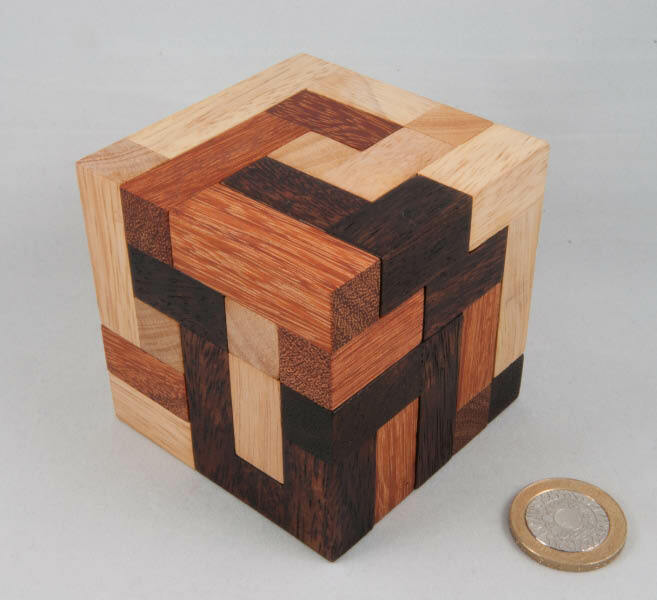 Robrecht Louage has been entering the Puzzle Design Competition for the last few years. 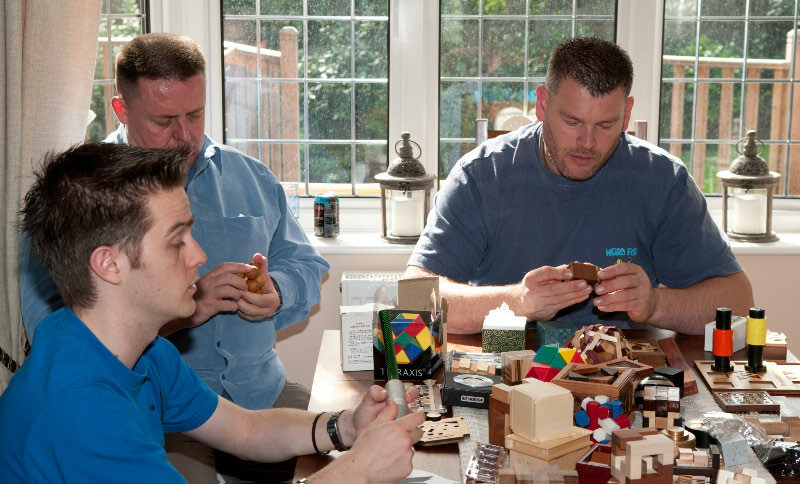 His distinctive style of puzzles are made in hard-wearing materials (like corian, acrylic and steel) so they not only feel like good quality puzzles in the hand, but you know they’re going to last for ages, even in the hands of amateurs like me! Remove the Yolk in 2010 (does not appear to be Spanish). 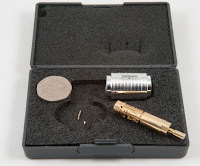 This year his 4-Steps Visible Lock was a popular winner of the Jury Grand Prize, and the name pretty much says it all! 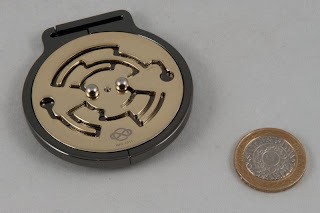 There’s a coin trapped in a slider that has a series of locks in the form of interfering steel balls (and some other stuff) to be negotiated. Most of the mechanism is on view all the way through the process – covered only by a sheet of clear acrylic – there a couple of delightfully deceitful elements in the puzzle that crop up at the start and at the end of the solution which may just have you doubting whether seeing really is believing. The solution involves working your way through 4 separate steps (the name is quite descriptive and helpful after all!) 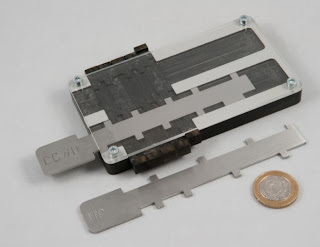 – the first one is quite neatly disguised and needs a bit of careful investigation to find, if you aren’t lucky enough to spot it right off the bat – it’s a reasonably common sort of mechanism and the “usual approach” will defeat it. 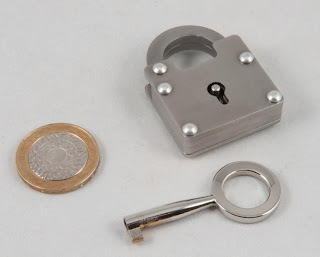 Next up is a pair of steps involving interfering ball bearings that need to be in the right place to allow progress – these are the bits that are always in full view and behave as you’d expect, without being overly fiddly … which leaves the last little lock to defeat – and this one’s cute! It’s staring you in the face the whole time, sort of, but it’s beautifully hidden all the same. If you’re in any way a serious puzzler, it won’t take you very long to solve this puzzle, but you will enjoy it! And I suspect that’s why it won this year’s Jury Grand Prize – it’s not too challenging but is very enjoyable. My copy came courtesy of Wil Strijbos, and I suspect that Robrecht might have some available as well - there's a link to his email address off the Puzzle Design Competition website. 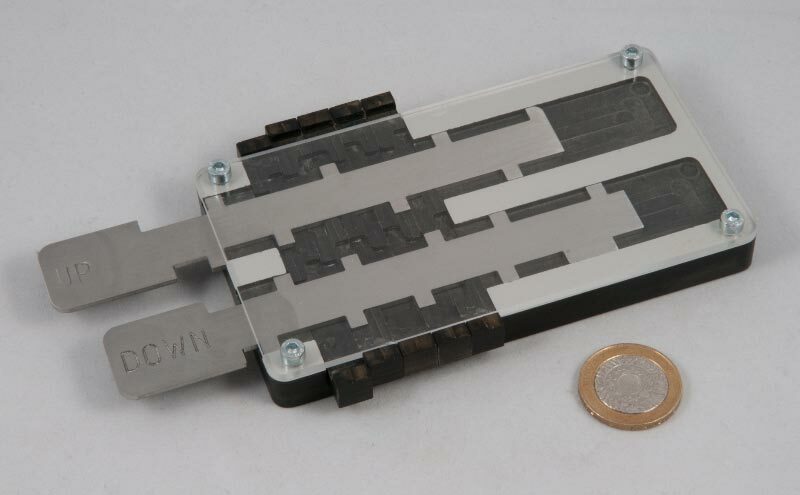 There's also a rumour that Eric might be offering some on Cubic Dissections in the near future as well. 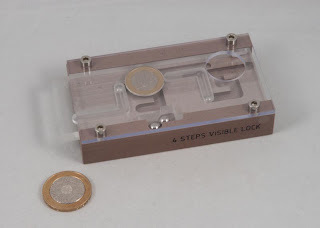 You can read Jerry’s take on the 4-Steps Visible Lock over here. As far as I can tell, this puzzle started out life known as 4D, when it was Oskar van Deventer’s self-designed exchange puzzle at IPP23 in Chicago. More recently, since January 2010, a slight variation has been available under the name Medal in Oskar’s Shapeways store. I remember spotting it in the Shapeways store while I was randomly exploring Oskar’s puzzles and thinking that it looked like an interesting puzzle, so I was rather delighted when my latest little order from Wil arrived with Louis when he came across for MPP3, and Wil had include a cast metal version of Oskar’s Maze Medal in lieu of the postage he’d saved by having Louis carry the puzzles across the channel. Everyone’s a winner!! The puzzle came in a Hanayama-style box, but the colours and branding looked a bit strange and on closer inspection, it bears the logo of the International Maths Olympiad – it seems that Hanayama have manufactured a bunch of these to be used as prizes or gifts for folks competing in the recent annual International Maths Olympiad held in Amsterdam – rather fitting since when assembled they resemble a medal to be hung from a ribbon, and handily they’re gold on one side and silver on t’other. 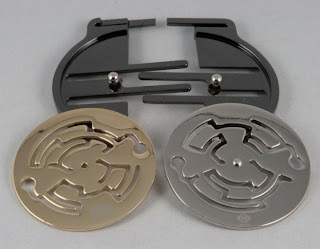 The puzzle is quite striking with the shiny gold and silver disks on opposite sides sandwiching a pair of black frames that each have a pair of pins to engage the mazes. The aim is to navigate to the end of both mazes in order to release the disks from the frames. 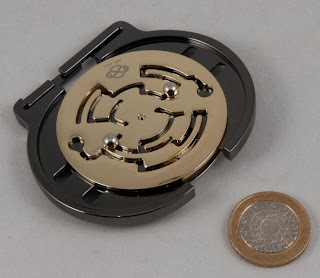 Navigating through the mazes is a combination of rotating the two disks independently to move around on an arc, and sliding the black frames in and out to move between arcs. Your movements are constrained by having to be at the same (in /out) depth front and back on each side (because the two pins on each black frame are opposite one another). It’s a lovely puzzle to sit and fiddle with – in common with almost all of the Hanayama cast puzzles, it feels solid and really well made and looks quite handsome to boot. All legal moves are smooth and clear and generally if you’re finding that a move won’t work the way you’re expecting, there’s something on the other side blocking you (because the disks spin quite freely, depending on how you choose to hold the puzzle, flipping it over can sometimes nudge a disk and block your move unintentionally). Fairly soon after I got it I managed to navigate all the way to the ends of the mazes, but couldn’t quite get it to release, so thinking that the two sides must release separately, I wandered off down a rabbit-hole and spent a while trying to navigate to each end of the maze individually… at some point I took a more careful look at the mazes and realised that the only place where you can expand the black frames that final little bit, was at the respective exits, so blitzed through the mazes and positioned both just about at the end and gave the frames a more solid tug than I had last time, and this time they parted, parking the respective mazes in their open position and allowing the puzzle to be dismantled. In case you’re interested, there seem to be a couple of subtly different brandings of this puzzle around: I’ve spotted that Puzzlemaster has them for sale and that their stock is Puzzlemaster-branded (instead of being IMO-branded), whereas the ones available from Sloyd are branded “Cast Puzzle”. Rainer Popp has been making puzzle locks for a good few years now and I’ve been a fan of them ever since I first stumbled across the T2 over at Grand Illusions. To date they’ve generally been machined from solid chunks of brass, making them large, heavy, and sadly, rather expensive. It seems that quite a few people have been onto Rainer and asked him to consider making something a bit smaller and a bit cheaper … and he’s listened, and recently produced the T6. It’s significantly smaller than its predecessors, but does it fit in with the rest of the Popplock family? To be honest, I was a bit worried that the T6 might not live up to its illustrious predecessors when I ordered it from Grand Illusions. Rainer has done an excellent job of establishing his locks as superbly manufactured, clever puzzles – the worst thing he could do now would be to cheapen that by putting his name to a simple puzzle that hadn’t been all that well made … it turns out that Rainer gets all that, and he’s managed to produce a great puzzle in an affordable package. 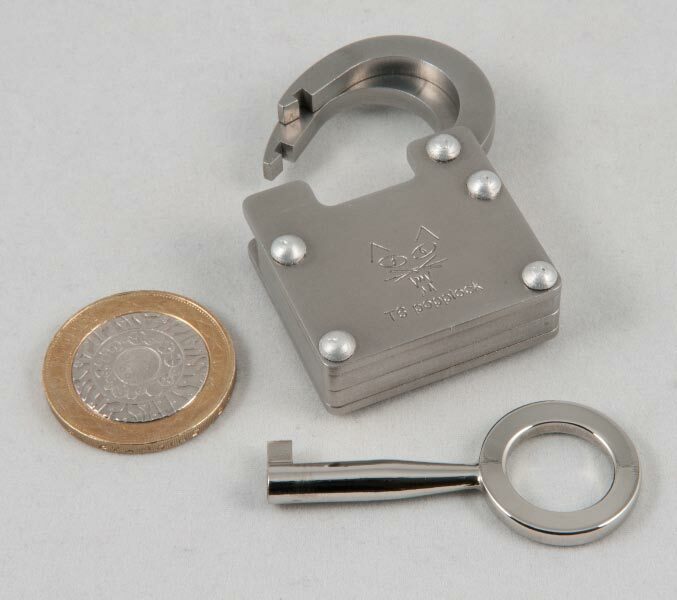 The T6 is a medium-sized padlock that comes with a fairly simple-looking key. Inserting and turning the key does not apparently unlock the padlock, however (but it’s always worth a try!). It may be smaller and lighter than its siblings, but the T6 is still a pretty solid little lock, and in common with all of the others in the range, it could certainly be used as a pretty secure lock. At first blush, there’s not a lot that you can do with the T6 – the key goes in, turns around, in either direction, and comes out. There’s nothing interesting in the rivets (you know that you’re going to try and move them, admit it!) 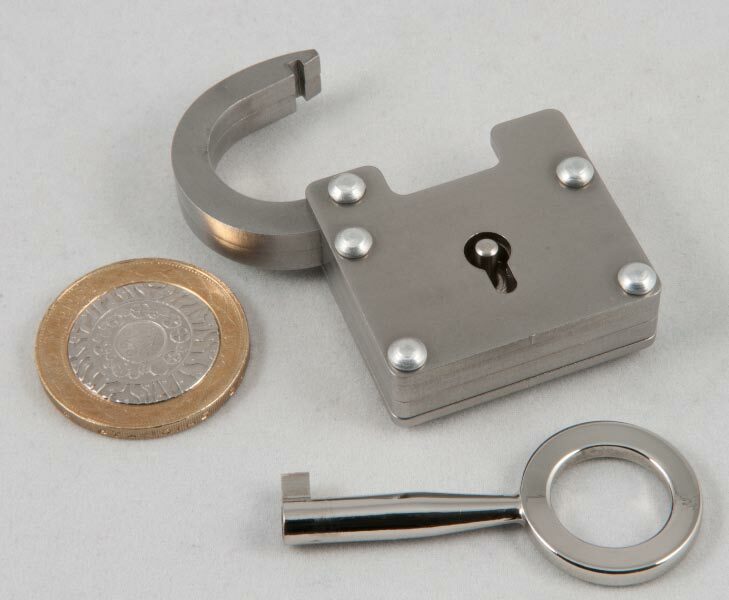 and although the body and hasp appear to be made up chiefly of a pair of thick steel plates, they won’t budge – pushing and tugging various bits randomly also teaches you absolutely nothing … Hmm, I’m liking this puzzle already! It may be smaller, lighter and more affordable than all of the other Popplocks, but it’s well and truly worthy of the family name – a very welcome addition to the line of Popplocks. Great design Rainer! At least two other renowned puzzle bloggers have written about their experiences with the T6 – you can read about Neil’s perspective here, and Oli’s over here. The first time I met Confusio was at MPP2, when Louis brought a recently purchased copy across the channel for our amusement. After a bit of tugging and prodding I managed to extract a few pieces and then managed to systematically demolish it, safe in the knowledge that I’d be able to build it in Burr Tools and reassemble it again. At the next MPP Louis presented me with my own copy of the Confusio, courtesy of the assembled masses as a thanks for hosting another MPP – gee, thanks! My very own copy of the puzzle that demonstrably bested me last time around – nice bunch, eh? 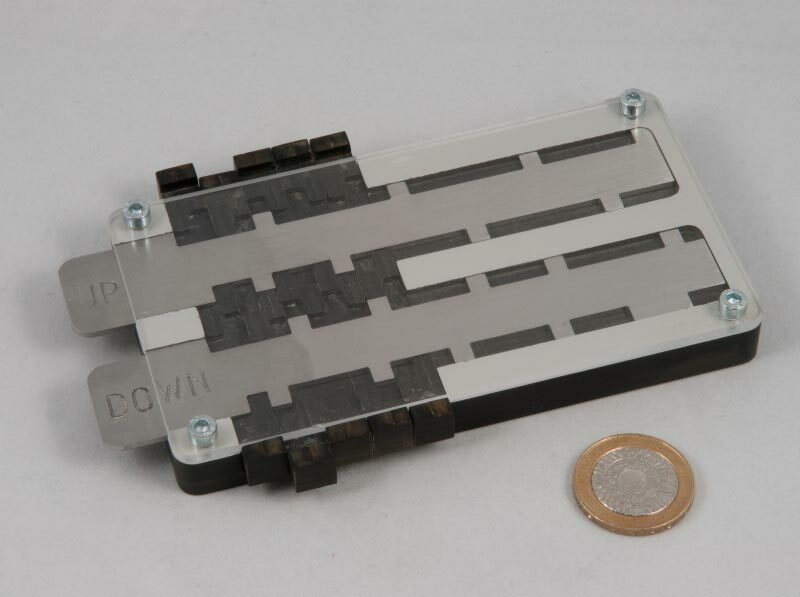 In a quiet moment after that MPP I found I really enjoyed playing around with Confusio – it’s a 9-piece 5*5*5 cube with no internal voids. 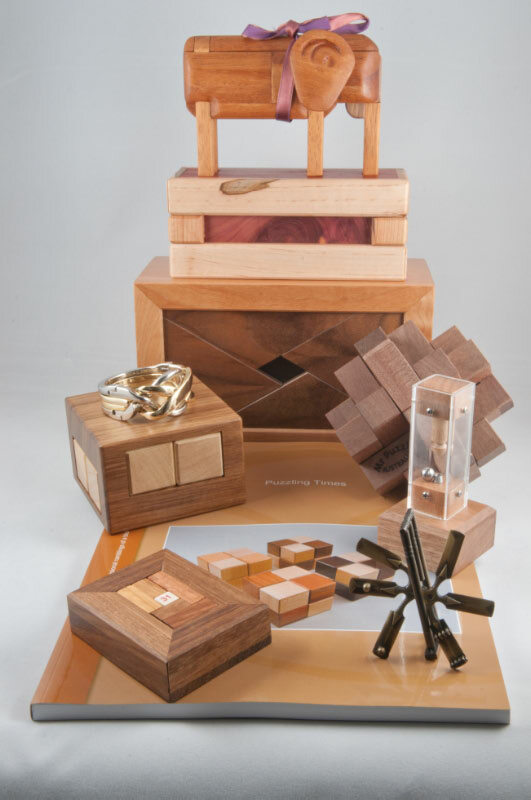 Each piece is made in a different colour wood and the interaction between pieces is quite impressive. While the very first piece can simply be removed (once you’ve identified it! ), most of the remaining pieces require a couple of moves each in order to release the next bit - something that makes reassembly considerably more complicated as you’re sometimes adding a couple of interlocked bits at a time and having to manoeuvre them into position in the right order. As a result, even lining up the pieces in the order that they’re removed in order to ease reassembly, produces a non-trivial problem. Given the level of ‘interaction’ between the pieces and the complexity of their shapes, I suspect that presented with just the pieces and being challenged to build a cube, I’d be busy for quite some time – and possibly not prevail. 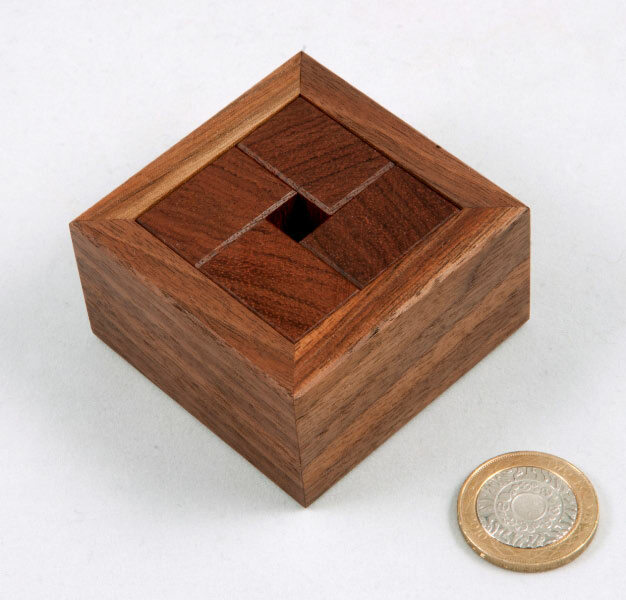 Really nice design from George Pfaffinger, neatly manufactured by Philos, available from quite a few respectable puzzle shops … thanks guys, I did enjoy it in the end!